Researchers at the University of Southampton have discovered that the unique 'Bursting Pulsar' – a neutron star which steals matter from a low-mass stellar neighbour – may also be the slowest known 'transitional pulsar' in existence. Transitional pulsars are a rare class of neutron stars, which alternate between showing X-ray and radio pulsations over timescales of years. 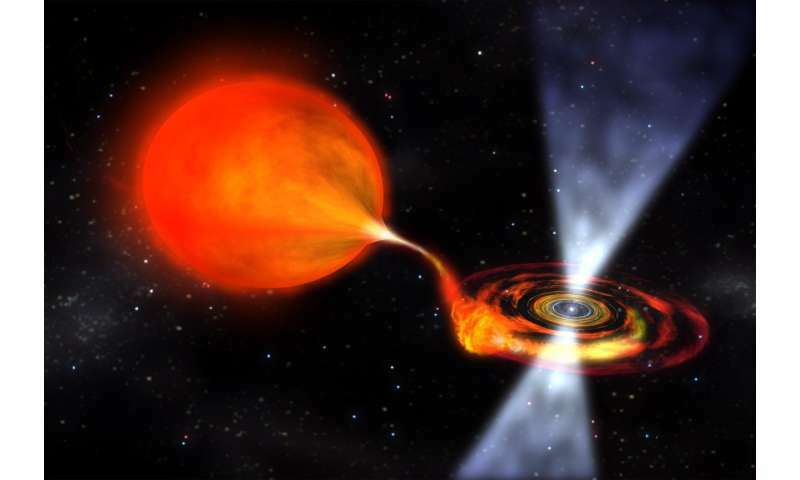 Jamie Court, postgraduate researcher in Astronomy at Southampton, has also found for the first time ever that the Bursting Pulsar (GRO J1744-28) has a tendency to 'hiccup' as it strips matter from a nearby giant star onto its surface. The observations feature in a new paper published in the Monthly Notices of the Royal Astronomical Society: Letters co-authored by Court with Southampton Principal Research Fellow, Dr. Diego Altamirano and Dr. Andrea Sanna at the University of Cagliari in Italy. "In a transitional pulsar system, a neutron star pulls matter off of a nearby sun-like star onto its surface," he explains. "This colossal river of star matter spins up the neutron star like an engine, leading to this city-sized object with twice the mass of the sun spinning hundreds of times per second. Friction forces in this stream also heat it up to millions of degrees; causing it to glow brightly in X-rays which we can see from the Earth." "But the Bursting Pulsar is unusual in a number of ways," Court adds. "The neutron star only spins about twice a second; while this may seem fast for something 20km across, this is about 100 times slower than the other transitional pulsars discovered so far, suggesting that the matter-flow engine somehow failed to spin the neutron star up as much as it should have. This in turn suggests that there is still much we do not understand about how these incredibly dense stars evolve over time. "In addition to this, the neutron star in this system has an incredibly strong magnetic field; more than 100 billion times that of the Earth, and 100 times as strong as any other known transitional pulsar," he concludes. "This exciting discovery will allow us to explore the messy physics of these cosmic hiccups in a more extreme environment than ever before. It shows that, even 6 years after being decommissioned, the RXTE satellite is still helping us to do great new science." Ah yes, the plasma ignoramuses pontificating fanciful faerie tales. There is very little to nothing of any valid scientific weight in the above article or linked paper. You're better ignoring it so no effort must be expended in forgetting this drivel.